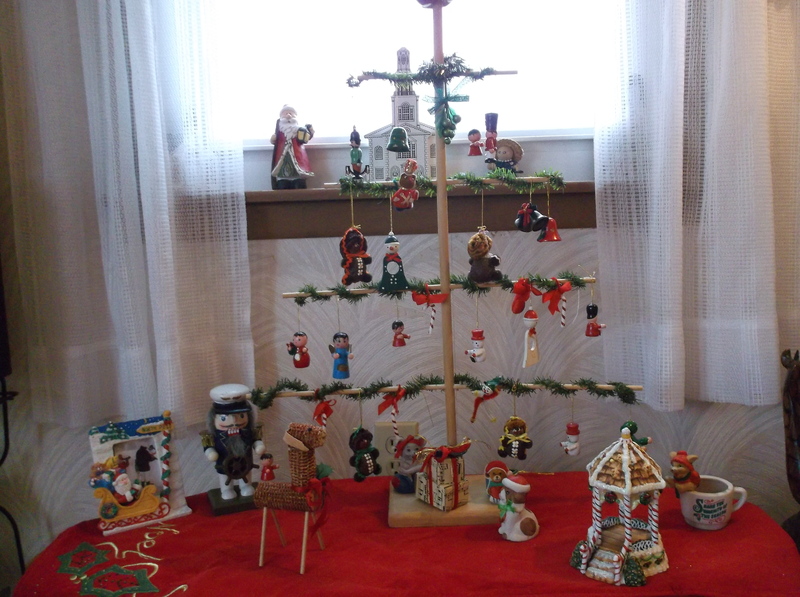 This year I had a great assignment of researching the traditions of Christmas. Why do we do the things we do at Christmas, what started the traditions and why. While the account of Jesus’s birth is beautifully documented by Luke and Matthew, there is no where in Scripture that tells us to celebrate the day. The word Christmas was not used until the year 125 AD when the second bishop Rome declared that a church worship service should be held to memorialize “the Nativity of our Lord and Savior.” Thus the word Christ mass, a worship service for Christ. These first church services were held in September. We do not celebrate the birthday or date of Christ. We celebrate the fact that Jesus came to earth through a virgin woman, leaving behind the glories of heaven to bring us into a relationship with God. 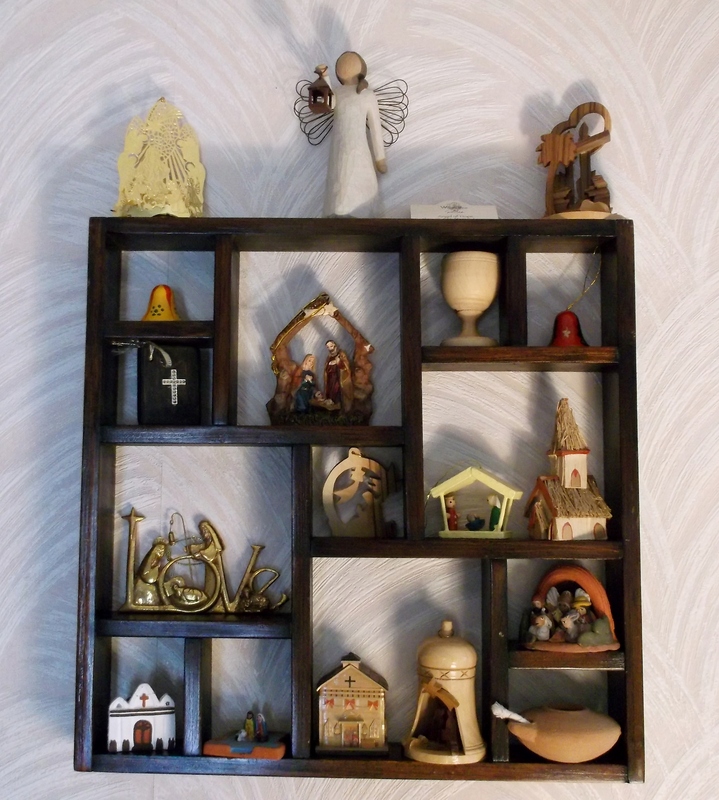 I love the reproductions of the Nativity scenes and have about 30 of them scattered around my home in various sizes during the holidays and keep several of them in view all year long. I love these little ones in my shadow box. 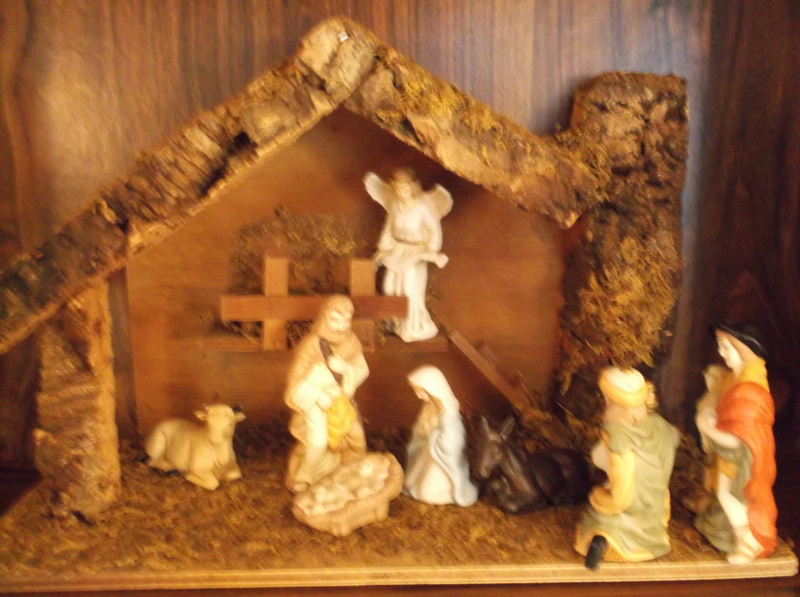 Although often pictured at the manger we know that the wise men did not appear on the scene until nearly two years later when at last the star led them to the house where the family was residing. When they saw Jesus they had an epiphany, and realized that this child was more than a future king of the Jewish Nation, He was the Christ, the long awaited Messiah. The church celebrates Epiphany 12 days after Christmas on January 6, to mark the arrival and the revelation of the wise men from the east. 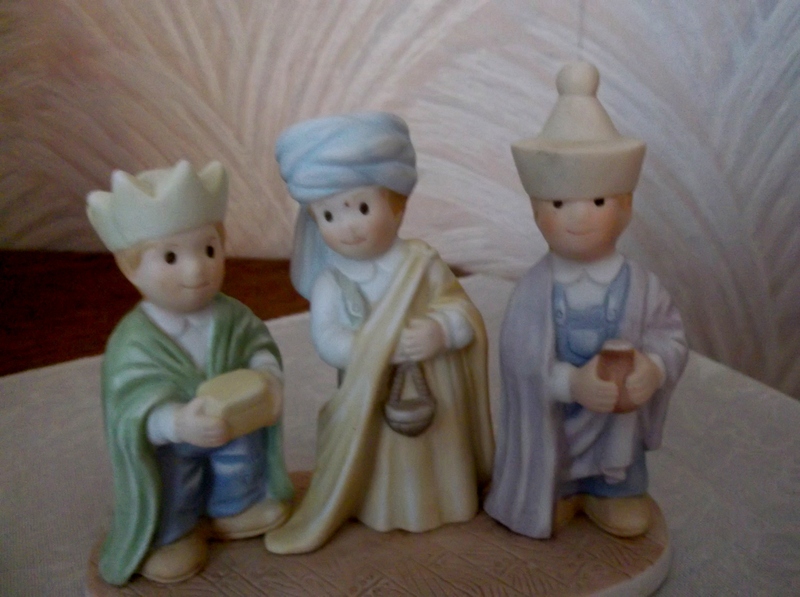 Here is my favorite reproduction of the wise men. By the year 274 many of Rome’s citizens were Christians, however the Emperor, Aurellian was not, and on that year the winter solstice fell on December 25th and he proclaimed the date as the festival of the “invincible s-u-n,” in opposition to the date Christians had wanted to celebrate the birth of the S-O-N. In the year 325 AD, Constantine, who had recently converted to Christianity, introduced Christmas as an immovable feast day on December 25. From that time on the date has always been known as Christmas, but the celebrations of the winter solstice days took precedence over any worship service for many years. 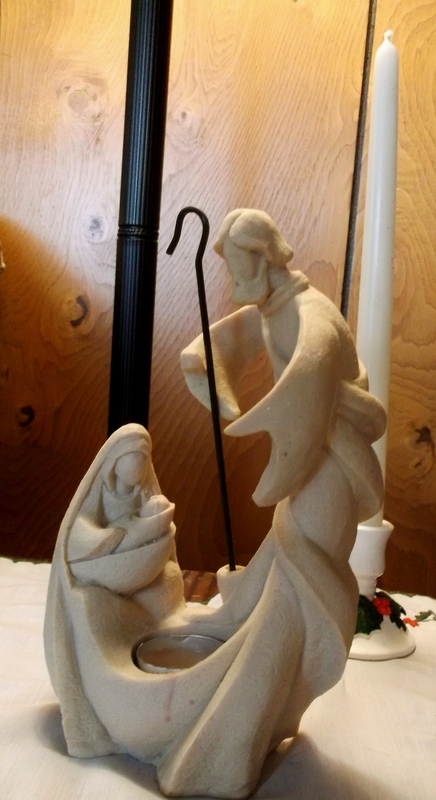 Over the next two centuries the hope for a Christ filled Christmas might have been lost if it had not been for many Catholic and Anglican churches persistently holding Christmas Eve and Christmas day services quietly in their churches and homes. Wassailing was the forerunner of caroling, and it was first introduced by poor widows and farmers, who took a bowl full of wine to the rich neighbors and begged for food or coin. Later it involved children who were more apt to touch a heart and bring home some much needed food. In the mid 1800’s the idea of Santa Claus and the lessons of Scrooge in the well known Christmas Carol, began to change the mind set of the people. Santa Claus evolved from the man known as St Nicholas who lived in Turkey and was a devoted Christian. He was a wise and wealthy young man who gave money and gifts in secret to the poor and needy. In America, the poem “The Night Before Christmas” made him famous and through various adaptations, eventually came to be the Santa we now know as the giver of gifts in secret. Here is my favorite reproduction of St Nicholas. 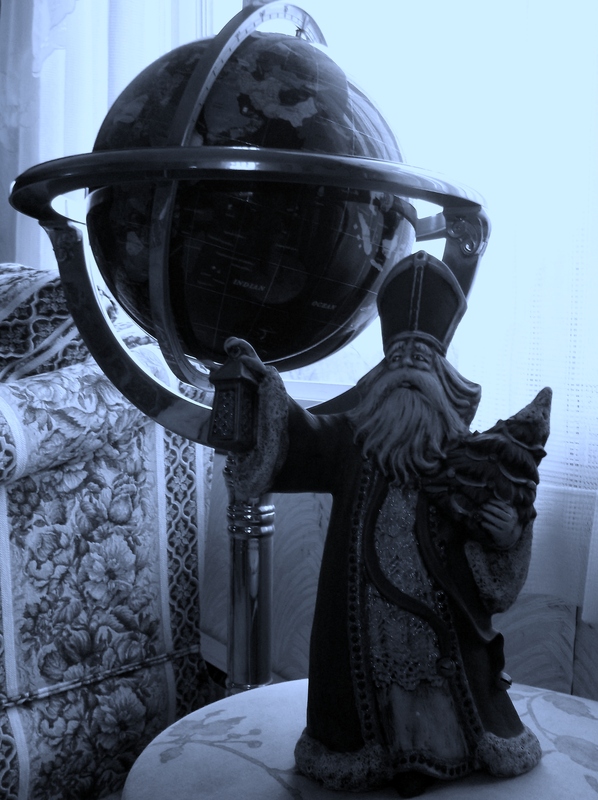 I put him in front of the globe because he does the work of Christ all over the world, in many different cultures, not taking the place of Christ but in the true spirit of Christ, helping those in need and giving the glory to God, not taking it for himself. He is one of the reasons we give gifts at Christmas. The wise men brought gifts and God gave us the greatest gift of all and that is the main reason we share and exchange gifts at Christmas. 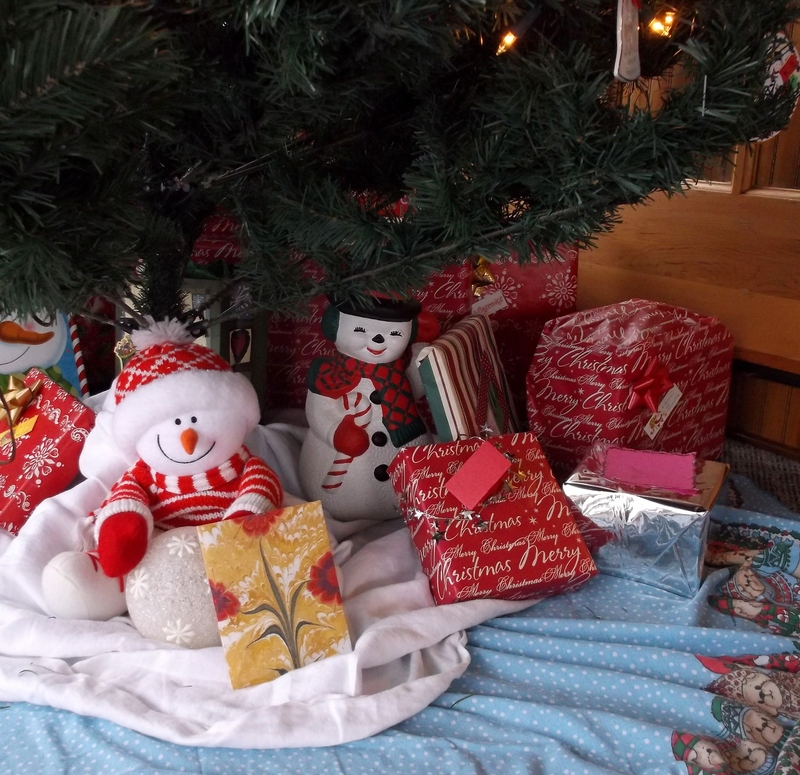 We put the gifts under Christmas trees. 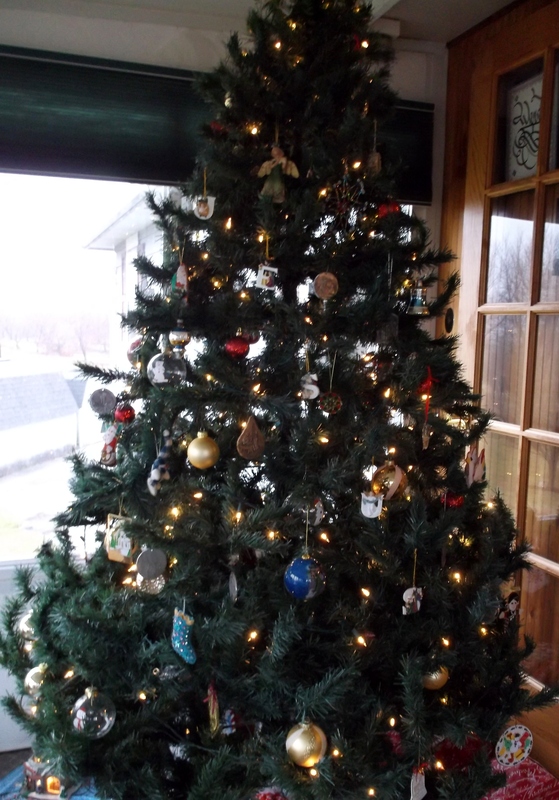 The custom of bringing a fir tree into the house came from the Vikings and the Germans who worshiped the tree that could stay green and alive through out the winter. Christian missionaries used the tree to teach the people how it resembles the eternal life given through Christ and how the triangular shape represents the trinity. Today we put lights on the tree to represent the Light of World and use it as a symbol of the life that Christ gives. 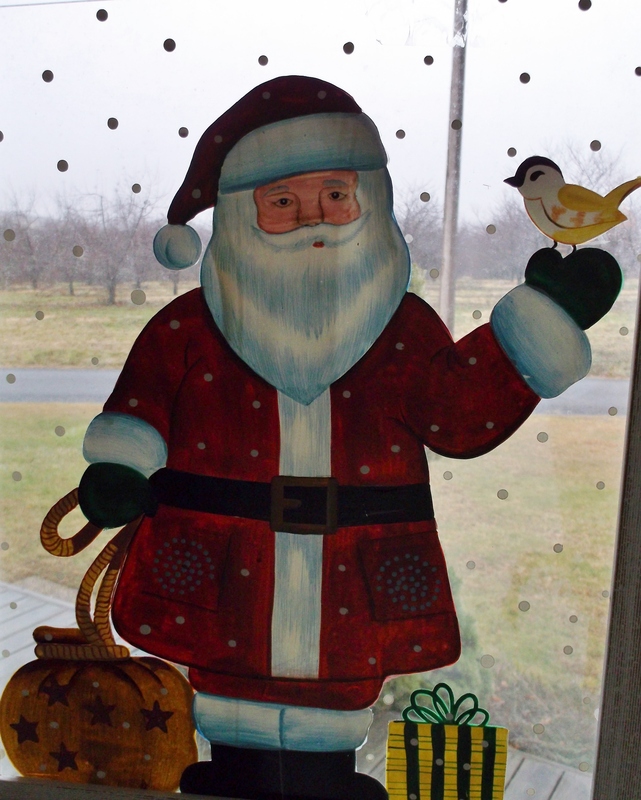 It has become one of the most popular Christmas decorations of all. My favorite reproduction of a tree. Made it when the kids were small, still love it. Christmas is a wonderful time of the year. You may celebrate a winter holiday, Hanukkah, or Kwanzaa and that is your choice, but if you celebrate Christmas, you can’t take Christ out of it, because He is Christmas, He comes with the tree, with Santa, with the gifts and in the times shared with loved ones. Whatever Christmas looked like to you, I sincerely hope your celebration held many joys. People in different places celebrate with different symbols, this looks inviting to me, but I would miss the fir tree and the anticipation of snow at least a little. I have to admit the year I was in Hawaii for Christmas, I didn’t miss it much. 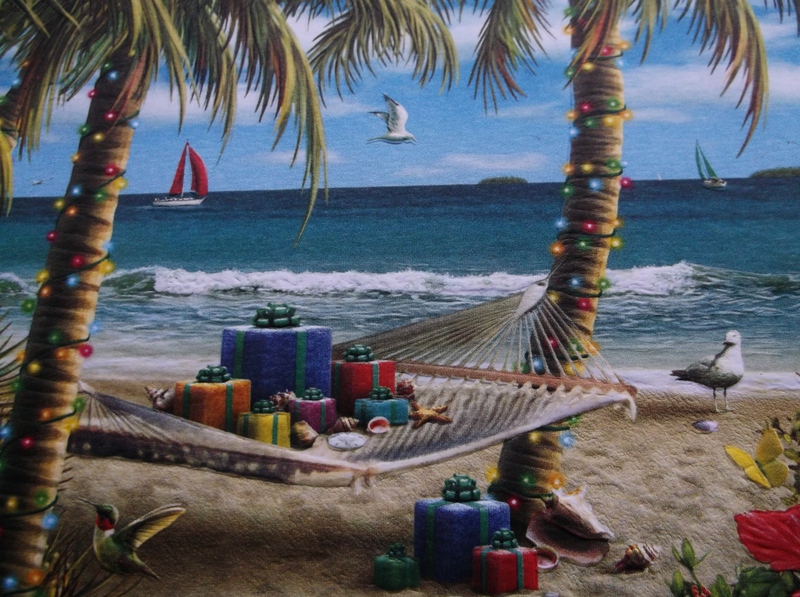 Maybe you would like to spend some time in this atmosphere thinking about Christmas or just hanging out on the hammock. Minus the gifts and lights it’s where I will be hanging out come April. If you would like to go there in your dreams, pick up a copy of “A Wish Called Wanda” and take your mind on a trip back in time and to Hawaii. Order from me or on line at Amazon.com or from Porthole publications.